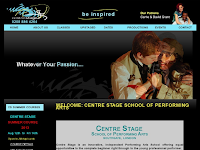 This week’s Website of the Week goes to the redesigned website of Centre Stage: School of Performing Arts. It utilizes a very flexible webpage layout and structure whilst making the most of its solid branding. Overall, it is an excellent platform, for an already successful and lively school of performing arts, to advertise what they have to offer to potential new students and bright young talent. Established in 1999, Centre Stage now provides training to in excess of 300 students, aged from 4 to 18, all of whom attend various part-time courses including drama, singing and dance. Centre Stage strives to offer a creative and high standard of teaching within the disciplines of Performing Arts. It is their goal to develop students’ understanding of the Arts, expand performance ability and increase self confidence through learning. As soon as you come upon the home-page you are immediately hit with an assortment of Drop-down menus running along the top of the page as well as custom-to-page sidebars running down the left hand section. Both of these features come with our Pro-pack which gives you more options when making changes to your site in The Toolkit. As a result, Centrestageuk.com is a hub of information from all sides and gives the website user an immediate and complete account of everything the school has to offer. Centre Stage also has the ability to edit and change all of these should they ever create new content and pages for the site later on. Ultimately, the redesign was shaped in large part using existing products that already used a recognisable colour scheme, logo and layout. Centre Stage already had a Prospectus, a Business Card and an Application Form that use the familiar looking design you now see displayed across every page. This is key in creating a strong brand and a professional looking company. Rightly so, all forms of their brand make use of their well known patrons, Carrie and David Grant and you can see this reference and photos of them in the header of the website at all times. Centre Stage, were really happy with the build process, and specifically the way that we easily understood what they wanted. They were also impressed by the communication in general throughout the project.